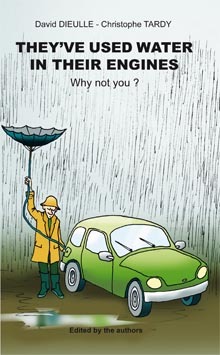 They've used water in their engine, why not you ? David Dieule and Christopher Tardy, Hypnow company. Since the end of the 19th century, several inventors have used water as an additive in internal combustion engines with the aim of reducing consumption and decreasing pollution. The best known nowadays is the American Paul Pantone. This reference work proposes an exhaustive, in-depth approach to the subject through the experience of the authors who have industrialised their original version of these processes in the form of a "ready to use", miniature catalytic reactor. Part 1 : A history of the main engines and processes using water to optimise combustion. Part 3 : Precise technical data allowing the comprehension and evaluation of the criteria necessary for the correct functioning of diesel engines equipped with an fuel economiser (including the plans of the SPAD and assistance with diagnosing problems). 39. And Hypnow in all that ?